We recently had the chance to chat with two of Chicago’s top interior photographers, John and Maura Stoffer. Last year the Stoffer’s bought a studio in the vibrant West Loop neighborhood in Chicago and completely remodeled it—and they installed all Monogram appliances. We love the look of their modern studio and how they were able to make the small space more functional. According to Maura, they wanted to have all the amenities of a full kitchen in their studio, but in a streamlined way. “This is why we love having the Monogram induction cooktop, because it takes up so little real estate and fits seamlessly into our countertop.” The flush installed induction cooktop doesn’t sacrifice any of their work space, either. But their favorite thing about their studio kitchen is the column duo: “We LOVE our column refrigerator and freezer. 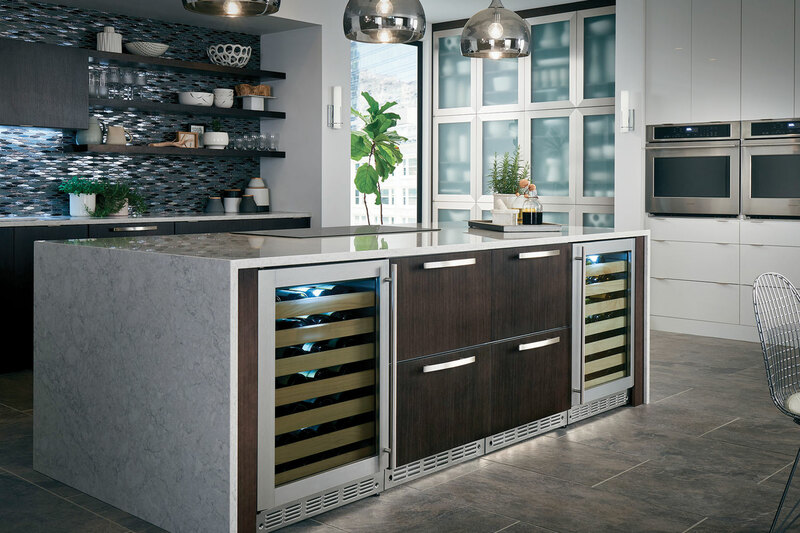 They have custom cabinet panels on them, so they blend right into the other cabinets, but when you open them, they are packed with beautiful LED lighting and technology,” said Maura. Having them blend with the rest of the kitchen makes it feel a cohesive part of the overall studio without seeming intrusive. The Stoffers specialize in residential interior photography, so they know a thing or two about good design and how to make a kitchen look its best. Being photographers, they love a kitchen or room with lots of natural lighting, but they also know that shooting directly into the windows is a challenge: “I’d recommend shooting on a tripod and exposing for the room and also the highlights of the windows and then blending those exposures together in post process,” said Maura about getting the best shot. The married pair share a mid-century modern home from the 1950s for their dwelling, along with their two children. They skew a bit more toward modern designs if they had to choose a favorite, but they’ve shot many gorgeous homes in the region—including a few designed by John’s mom, Jean Stoffer, a prominent interior designer. When setting up a shot in a new room, they look for an eye-catching feature or focal point. “We love shooting down aisles in a kitchen because of this,” said Maura. We love the look of the Stoffer’s new studio and all of the fabulous kitchen photography they’ve done for Monogram. Be sure to follow them on Instagram to catch more of their inspiring work. A true balance between traditional and modern design can be tricky. This complex endeavor requires a refined eye, thoughtful attention to detail, impressive design expertise and patient listening. This beautiful old world, new world kitchen design by Claire Staszak is an elegant example of this delicate balance. We interviewed Claire to learn more about the clients, her design process and the overall goal for the home. SRFD: What was your inspiration for this kitchen design? Claire: The design inspiration was really a mix of my client’s taste. The wife wanted a traditional white kitchen and loves intricate detail. The husband wanted something more modern and preferred clean lines. I helped them meet in the middle! SRFD: Were there any specific directions or needs given from your client? Claire: The client wanted white cabinets and the space needed to be very durable and family friendly. We also had to work with the soffit that could not be moved due to HVAC locations. I felt it was very important to camouflage the soffit as much as possible. Creating the built-in breakfast nook was something we all thought would be an ideal use of form and function. Great use of the window bay and family friendly for lots of meals! SRFD: Were there any challenges you had to overcome? Claire: Figuring out the right way to trim out the soffit so it blended seamlessly into the backband and crown was a detail we gave much consideration to. We also were able to use some existing cabinet boxes (we replaced all drawer and door fronts) so the beginning was a bit like a game of Tetris, seeing what we could repurpose and what new cabinets we needed. SRFD: How long did it take from beginning to end? Claire: This kitchen was part a larger whole home remodel. The project started in January 2018 and was completed in July 2018. SRFD: What is your favorite element of this kitchen? Claire: I think the improved proportions of the kitchen overall are my favorite part of the design. The old kitchen had a decent floor plan, but we were able to make it more beautiful by balancing the the space with a bigger hood, built-in banquette and overall modernize the material selections. SRFD: What sparked your decision to use Monogram appliances? Claire: This client needed all new, high quality appliances, some of which could be panelled. Monogram offered a wonderful full suite package with a few bonuses (like the blower for custom wood hood) so it was a great fit for this active family. SRFD: What would you tell other designers about using Monogram? Claire: Monogram has exceptional customer service and training. If you’re near a showroom, send your clients in to have a date night cooking on the appliances! Claire Staszak is a Chicago-based designer known for her holistic design process, which combines her well-trained eye for interiors with her passion for wellness. Her work has been featured by The Chicago Tribune, Modern Luxury, HGTV, Domino, Architectural Digest online and more. In 2017, the company’s namesake blog, was honored with an award for Best Design Writing by the Design Influencers Conference. She has studied interior design at the School of the Art Institute of Chicago and holds a Certificate of Kitchen and Bath Design from Harper College. Claire is also a certified yoga instructor with more than 500 hours of training. In 2018, Modern Luxury Interiors, noted Claire as ‘One to Watch’ in the interior design industry. Monogram has the pleasure of working with so many talented and impressive designers across the country. Nicole Ellis Semple with Kuklinski + Rappe Architects in the Chicago area is a true design professional we enjoy partnering with, and wanted to learn a little more about her background and experiences. Nicole: Even as a child I was always specific about the aesthetics of my environment: the colors, the placement of furniture, finding practical objects that were beautiful. My mother is a pretty serious seamstress and crafty gal so I grew up around textiles, color, woodworking, and painting. My father is handy and took up woodworking and remodeling our house, and several of my uncles are in the construction trades. Design and construction were always a part of my life. In my seventh grade shop class we had to design and draw a house floor plan and something clicked for me. I came home that night and told my parents that I wanted to be an architect. SRFD: Tell us about your recent projects. Nicole: We worked on two projects recently that involved subtle plan changes with a big impact on the spaces: one is a very contemporary design, the other quite traditional. Our Little Green Kitchen is a bold renovation of a small condo kitchen that previously had bland finishes and a poorly planned layout. The client wanted a colorful geometric backsplash with coordinating cabinets. We created a color blocked space with a much better work flow. Despite the bold pattern and color, the space is bright, fresh, and well-proportioned now. Inversely, we recently completed a very traditional English cottage style kitchen on the North Shore. We reconfigured a winding floorplan in a small home to create a generous galley kitchen, a butler’s pantry that doubles as a laundry room, relocate a basement stair, and improve a bathroom. The house is small, but by cleaning up the plan and lightening the color palette, we were able to make a dramatic improvement. And I’m excited about a third project that will be complete this summer: we moved the kitchen in a project we completed 15 years ago from one side of the house to the other. This is our third project for this client, and as her tastes and times have evolved, she decided she wanted something completely different. She put total trust in us to turn the house upside down and I’m not sure who’s more excited about it – her or us! Nicole: I appreciate the increasing desire to live simply in small spaces. Our best innovations come from serious space or budget constraints. I love exploring how to use the existing envelope of a home to make it work better without an addition. Subtle changes can have a much higher impact in small spaces. And when clients decide to pare down their belongings, those improved spaces feel so much lighter and brighter! SRFD: A trend you are over? Nicole: As classic as it may be, I’m really over standard white Shaker cabinets and basic white subway tile. I’d much prefer to see a similar rhythm and clean lines achieved in other ways. At the very least, we like to play with the edge profile or panel to give it a little oomph. If you’re already paying for a designer’s expertise and/or custom cabinetry, why select something so ubiquitous? Make it personal! Nicole: We’ve been using Monogram for years now. They are a go-to for solving space problems and innovative technology: a 48” wide range with an oven cavity large enough for the heftiest of Thanksgiving turkeys, or a just-right sized built-in refrigerator for a small condo. We appreciate the consistent pace of innovation and that Monogram seems to have a perfect product for every client. They were a joy to work with for our Little Green Kitchen, which is fully equipped with Monogram appliances. Monogram has the pleasure of working with so many talented and impressive designers across the country. Jean Stoffer with Jean Stoffer Design in the Chicago area is a true design professional we enjoy partnering with, and wanted to learn a little more about her background and experiences. Jean: I became interested in design soon after graduating from college in 1982. After getting a business degree I went to work for a small interior design firm as the business manager. I was fascinated by what they were doing. The principle designer was very kind to me and informally apprenticed me when she observed my interest. I’ve never looked back. Jean: Our firm has been given the opportunity to do design work in many older homes with fabulous architectural details. We find it particularly gratifying to embrace this architecture as a gift and work with it to modernize the homes in a way that compliments how we live and work in our homes today. One such project we completed recently was in a 1902 Victorian in West Michigan. Very little had changed in the home over the decades. Although it was in rough shape, all the original moldings and some very special doors and windows were still there. Score! To agree with how the family lives we moved the kitchen into the original dining room, the family room into the original back parlor, and the dining room into the original front parlor. We made the old kitchen into a mud room, laundry room and powder room. Upstairs we converted one of the bedrooms into a bathroom. We kept the character, and whenever possible highlighted it. It was a triumph! Both we and the clients are delighted with the results. Jean: I’m excited about the trend embracing more color. Particularly in wall paint and accessory items like pillows. Jean: A trend I’m over is recessed can lights proliferated in every single ceiling of an entire home. SRFD: Tell us about your relationship with Monogram. Jean: I have had the good fortune of attending a designer training event with Monogram at the Chicago Merchandise Mart. Since that training I have felt confident to spec Monogram in projects and educated enough to explain to the client why Monogram is a wise choice. We recently came across a beautiful kitchen designed by Natalie O Design on Instagram. We were so entranced, we asked if Natalie Officer, the creative force behind the company, would tell us a little more about herself … and share some additional photos. Take a look! Natalie: It started so long ago, the memory of exactly when is foggy. What I have always loved is the ability to make an impact and positive outcome in such a short amount of time. To truly affect a space, a design, a person in only a couple of days is motivating. It inspires. Natalie: I am always excited by new collaborations or iterations, and love the fresh impact of colors. As far as trends, I try to stay clear of them. SRFD: Tell us about this kitchen. Natalie: This kitchen belongs to a local Louisville-area family. It was a renovation from awhile back, but their matriarch, Nicole, is a busy yet wonderful mom and realtor who prefers tackling a little at a time! We’ve been fortunate to help her select vibrant wallpapers and fabrics to work throughout other rooms in her home, and to this day we’re still in touch! We’re currently adding some custom touches to her entry way. This kitchen renovation was a true mix of traditional style and modern functionality. Cabinetry and hardware selections were key here, using paneling on appliances such as the refrigerator. Nicole didn’t shy from mixing metals, using brass, stainless and even rose gold touches on her serving ware. The result is a warm, calming and inviting space for family and guests to gather. Learn more about the Natalie O Design team here and explore this home and story exemplifying their true nature as a design company. We have the privilege of partnering with impressive designers from across the country, including Mary Jo Peterson, President of Mary Jo Peterson, Inc., and a columnist with Kitchen and Bath Design News. Learn more about Mary Jo in our interview with her. Mary Jo: Having started in education, I was crazy about design and anything to do with the kitchen when I headed to the showroom with the best reputation in Connecticut for my own kitchen renovation. There I met Lorey Cavanaugh, a phenomenal designer who not only saw me through to my new kitchen, but also brought me into the world of kitchen and bath design. Early on, I became interested in universal or inclusive design, and this became my professional passion. Mary Jo: We recently completed the combining of two adjacent condos into one, a three story space, and incorporating client-specific access for a couple, one of whom has a degenerative condition, so sort-of a moving target. The overall space included kitchens on two floors, multiple bathrooms and the need to provide ease of movement throughout. It was what I call a reverse universal design project in that we started with specific access and then expanded to include spaces that will work for both members of the household and guests. SRFD: A trend you are excited about? Mary Jo: The growing availability of modular appliance options- cooking modules that let one have it all, some induction, some gas, and more, as well as refrigerator/freezer/beverage storage columns that allow one to plan multiple units in multiple locations and of various sizes. This all does so much to allow us to personalize the space for each particular client. This is obviously great in large kitchens, but it also allows us to make the absolute most of small spaces. Mary Jo: Stacked oven cabinets. I really appreciate the design aesthetic and the function of the horizontal line in appliance installation, particularly when this can be accomplished in mid-height cabinetry. It gets easier and better as our appliance manufacturers create a variety of appliances at the same height. Mary Jo: My relationships with GE and Monogram go back many years and includes some of my favorite people and experiences. One project that stands out is the Real Life Design Kitchen, which we created for GE to tell their universal design story and to promote the concept within the design/build community. This was back in 1995 (or about then), showing GE and Monogram to be ahead of the curve, and in fact, the newest version of that same kitchen anchors the Real Life Design Lab at VA Tech today. Design innovation is a reason I continue to keep up with what’s new at Monogram. Through our activities in the Chicago area, we came across Wendy Franz, owner and lead designer with Studio 912. We were so impressed we had to learn a bit more about her. Wendy: I have had a remodeling business with my husband since 1995. We operated our business out of our home, which was the perfect setup for me as it allowed me to be home and flexible for our kids as they were growing up. About 15 years ago, we remodeled our own kitchen and it was fun being able to plan every single spot in the kitchen for maximum use and efficiency according to how we use each area of the kitchen. It sparked my creativity and gave me a desire to be more than the person in the background handling operations and office matters. I wanted to be more involved with the customers and in the design process of our projects. In 2010, I investigated whether any of the local colleges had a specific degree or program specifically for kitchen and bath design and was so excited to find that Harper College in Palatine did. It was a certificate portion of their Interior Design Degree. I went in two different shifts, taking a 2 1/2 year break from school and being in business for myself due to the recession, but when I was able to return to the industry, I picked right back up where I left off school wise. So thankful that I did. It is truly a passion of mine, creating beautiful spaces for my clients that they love to wake up and come home to – a space that gives them a place of peace, comfort and refuse from the world around them. Now that I have my own design studio/cabinet and countertop dealership (two of them actually, one near our home in Crystal Lake and one that I partner in with a fellow Harper student) and having the suburban location be in front of my husband’s woodworking workshop has given us a business that we can employ both of our daughters in. It’s nice to be working side by side with my hubby again and it’s such a huge plus to be able to offer woodworking piece in my designs to our clients, such as barn doors, tables, countertops and now, we’re starting to offer custom hoods too. Down the road, I hope to have time to create custom vanities too. Wendy: We just wrapped up project for a repeat customer who we had done woodworking for in the past. This time, she came to us to design her kitchen, using two of our three cabinet lines. We did the perimeter in a white transitional door style and the island/hood/cooktop cabinetry along with the butler’s pantry and a bar wall in a dark stained rustic cherry. We used three different Cambria countertop patterns along with a reclaimed wood table extension off of the island and reclaimed shelves. She put in eight different zones of lighting and very interesting backsplash tile. Can’t wait to get in for the photo shoot. Wendy: The combination of wood grain cabinets with painted. Or the use of different colors throughout a space. We’re about to have a kitchen installed that we designed in a sleek white Acrylux door style on the uppers and a lined dark Acrylux door style on the lowers with a couple of aluminum/glass door cabinets mixed in. Should be very elegant and classy. Wendy: There have been so many white shaker kitchens, but we like to do them with touches of uniqueness that make them anything but the typical cookie cutter kitchen (as can be seen in the kitchen above). Wendy: We have a Monogram Advantium Speed Cooker/Microwave along with refrigerator drawers at our Chicago studio and LOVE using them and showing them off. We are recommending Monogram to all of our clients and will be meeting with the Monogram folks to talk about how we can have a more involved relationship with them. Can’t wait! Following our exciting partnership announcement with designer Laura Umansky, we wanted to learn a little more about Laura and her design background. Laura: Creating beautiful environments has been important to me for as long as I can recall. As a child, I would draw home plans, sketch my room layout, and design my personal space from top to bottom. Luckily, my mother let me have control of this from a very young age. Most likely because she was not interested in interior design at all! In undergraduate school, I studied Art and didn’t hone in on the profession of Interior Design until late in my college career. After graduation, I knew that I wanted to dive head first into interior design and I started working for a fantastic designer who showed me the ropes. After a year, I enrolled in graduate school and, in 2005, received my Master of Architecture Degree. Studying Architecture definitely had a huge impact on the way that I approach interior design and how I structured my firm. I started Laura U Interior Design in 2007 and we are celebrating our 10th anniversary this year. It is such an incredible milestone and I couldn’t be prouder of our team. I am so excited to see what we can all accomplish in the next 10 years! Laura: Currently, I am working on my own home: a 1925 Tudor Revival in a Historic District of Houston. It is a fantastic home and I love the neighborhood. Being a historic home, it has had it’s share of challenges: foundation issues, termites, etc… All things you may expect with a home that is nearly a century old, but none of them are really fun to deal with. What is fun to deal with is the design of the home and bringing it back to it’s original glory. It will be a gorgeous and stately home when it’s finish; perfect for the Monogram appliances that are going in our new kitchen and butler’s pantry! Laura: As I write, I am at High Point Market in North Carolina. I love market because I get to see all of the brand new introductions from the best design houses and manufacturers in the business. Right now, I am very excited to see the classic contrast of Black and White everywhere! I love the crispness of this pairing and you will see plenty of this in my new home when it is unveiled in the Spring. Laura: I am never really completely over any trend because it always comes back around at the right time. For example, who saw macramé being 2017s go-to wall art? For this very moment, I can do without large scale floral wallpaper. It is gorgeous but I think I have seen it implemented just enough to get me through the next decade! SRFD: Why are you partnering with Monogram? Laura: Monogram is everything my Classically Current design philosophy is grounded in: it is synonymous with luxury and livability. My Monogram appliances are timeless in look yet are modern in performance. As a mother of 5-year-old twin girls, my home must be beautiful, warm and welcoming to our friends and family, and it has to support our busy (aka crazy) daily lives. Monogram appliances easily check each of these boxes! The Louisville Monogram Experience Center (MEC) brings designers to Louisville, Kentucky, for two-day experiences to learn about Monogram, the design process, our appliances – and even cook with them! We interviewed each designer to learn a little more about their background and design experiences. Today we’re featuring Mary Kathryn Strong with Trey Strong Custom Homes and MK Strong Design based in Lubbock, Texas. Mary Kathryn: I have always paid attention to design even before I knew it would be my job. I used to listen to my grandmother talk about antiques and how she was always planning her next decorating scheme. She had an interior designer that she loved for many years and they would talk about different textiles, colors and interior styles. She taught me that if you love something like a piece of furniture or color, you can make it work for you and the rules are there aren’t any rules! Mary Kathryn: One of my recent customers built a beautiful, traditional, two-story home. My style is probably a little more sleek than ornate, but they had huge, rare pieces of Baroque artwork they wanted all over the house. It was fun to incorporate them and have them against such clean and spacious backgrounds. Mary Kathryn: New trends that aren’t really new … I’m glad color is coming back. I love a neutral house, but I need a little “pop’ here and there. Mary Kathryn: I’m over all or nothing. I don’t like all grey or all taupe. Or all white. I like to mix and match the grey and tan. I think of it like jewelry. Gold and silver can be mixed and be timeless. I feel the same about a house. SRFD: What did you learn during your Monogram experience. Mary Kathryn: First of all, I thoroughly enjoyed my Monogram experience. I learned more than I could ever imagine about how a dishwasher works 🙂 I thought it was really cool to understand the technology behind refrigeration. The cooking experience with the chefs was a great lesson in heating your oven and pans before cooking. Most important, I am using Monogram on my next kitchen design project!